Blog to End the Occupation: Friends Don't Let Friends Buy SodaStream! Actions from our member groups American Friends Service Committee- West Region and Sacramento Area Peace Action. SodaStream, a gadget for making carbonated water at home, is made in an illegal Israeli settlement on stolen Palestinian land in violation of international law! Folks who care about human rights and are out shopping for the holidays, could end up inadvertently buying SodaStream because they don’t know the facts. To learn more yourself about why you should not support SodaStream, see here. ♥ Please help prevent this from happening by signing this petition asking stores to stop selling SodaStream, and by asking your friends, family, colleagues, etc. to do the same! Email them, post on Facebook, etc! :( If you know of anyone who has unfortunately made this purchase, ask them to return SodaStream to the store, along with a letter explaining why they cannot ethically purchase this product. And refer them to one of the many SodaStream alternatives! ♦ If you see SodaStream on sale, please speak to the manager and fill out a comment card asking the store to stop selling it. You can also contact store CEOs directly; contact information is posted at: http://sacbds.org/store-contacts/. 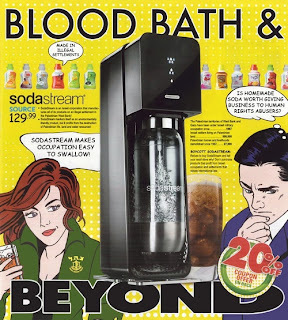 Stores selling SodaStream include: Bed, Bath and Beyond, Best Buy, COSTCO, Crate & Barrel, JC Penney, Kohls, Macy’s, Sears, Staples, Sur La Table, Target, Walmart, and Williams-Sonoma.